Sophia’s first birthday party was this past weekend. We went with a circus theme, which I wrote about here. We had circus elements throughout the whole party and it was a huge success. Here is how we put it together. We strung balloons on string from our fan to three points (one on a curtain rod, another on a second curtain rod, and another on a kitchen hook). 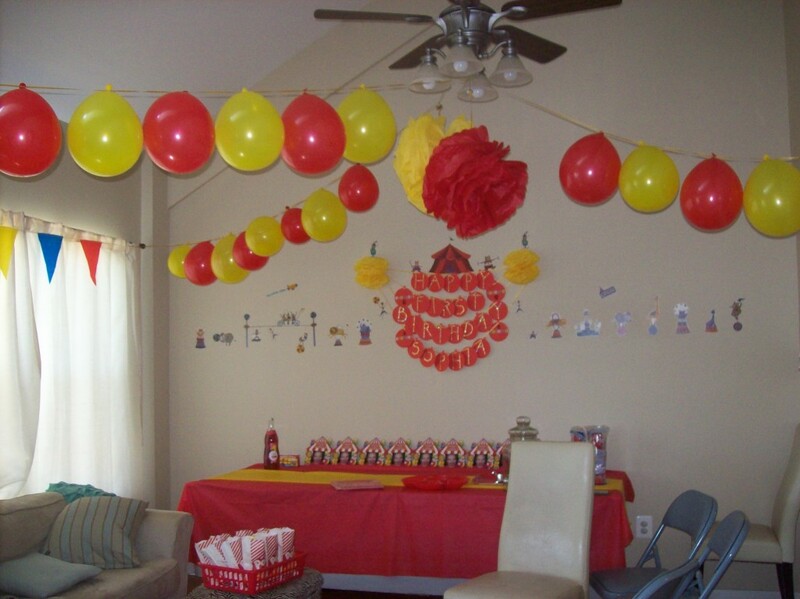 We had the strings of balloons draped in such a way to mimic a circus tent. We made huge tissue paper pom poms, which I wrote about previously here. We kepts everything in our theme colors: red & yellow. We hung a Happy First Birthdy Sophia on the main feature wall, which I wrote all about here. We also picked up a package of circus themed wall decals, which we displayed to the right & left of the main bunting banner. We picked up some carnival-themed photo cards and put Sophia’s picture in it. We displayed these in a row on the table. They served as decor & favors- each guest could pick one up when they left. We also made a huge photo collage in the shape of a the number 1. We glued the photos onto poster board shaped as a 1, and then taped that onto the wall. We love how the whole party turned out and how it all came together! The clearness in your post is simply cool and i can assume you’re an expert on this subject. Fine with your permission allow me to grab your RSS feed to keep updated with forthcoming post. Thanks a million and please carry on the gratifying work.